CardMonkey's Paper Jungle: Whymiscal Christmas and New Years Blog Hop - Dec. 28 and 29 ..
Whymiscal Christmas and New Years Blog Hop - Dec. 28 and 29 ..
One of the greatest joys of Christmas, I think, is getting ourselves into a joyous carefree child-like and magically whimsical mode -- much like it was when we were children. So it was in that spirit that I hope to reclaim that I joined this Whymsical Christmas Blog Hop ... and share with you the quite long novella chapter, below. First, a story and a card. 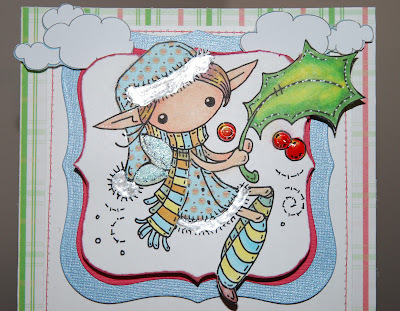 I made this card to bring out my Inner Christmas Fairie (ICF) ... long lost by the pressures of today's strife-filled world. 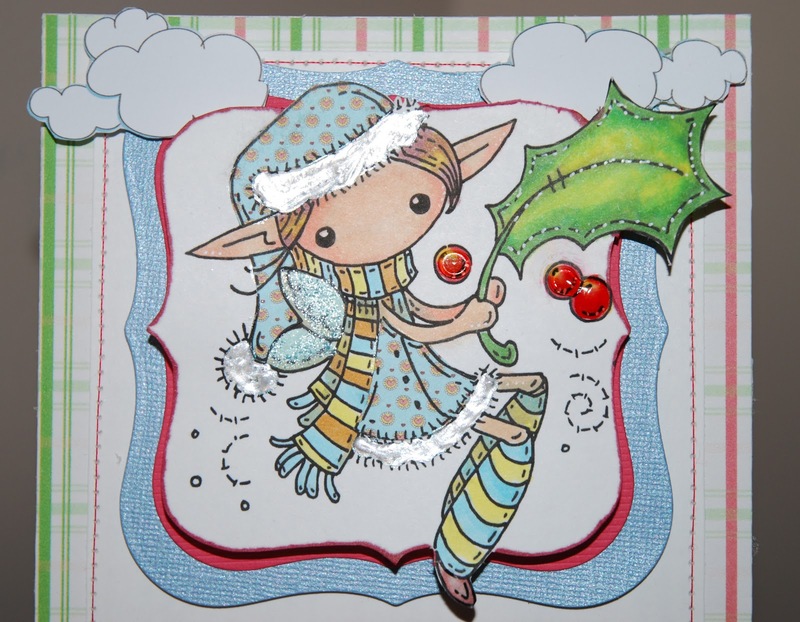 Christmas Fairie digi-image and sentiment by MelJen Designs: paper piecing and specialty papers by Nikki Sivils Scrapbooker LLC paper; colored with Copic Markers; mounted with Ranger dots, machine and faux-stitched. Have you and your family members yet gotten into "Elf on the Shelf"? The principle behind it is that Santa needs little magical helpers to watch for those girls and boys who may be naughty and nice. The theory is that nightly, the Elf leaves his familiar perch (by Elfin -- or parental -- magic! ), visits the North Pole to rat out boast about the household children. 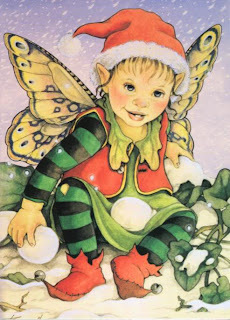 I'd like to start an Elfin tradition for my little granddaughter Charlotte next year. But before "Elf on the Shelf" was ever dreamt up, there were Kindles. Kindles are Elf-like miniatures from Santa's workshop made by a local (to me) company called Byers Choice. I happened upon the sales prototype for the Kindle, and snatched up 20 or so to make my own Santa's workshop as decoration one year. I was so taken by these little guys that I approached one of the company's vice presidents, Jeff Byers, with a marketing idea and a story about the founding of the Kindles. While I didn't get a marketing job, the copy for my story was bought by Byers Choice, and a good bit of it was used on the packaging for the Kindles, which sell nationwide for $25/ea. I can't find my original copy that I sold to Byers, but below you'll see a chapter I wrote on "spec" for a broader book about life in the North Pole. I hope one day to expound upon it and share it with Charlotte as a gift -- maybe next year, even though it will be self-published and perhaps self-illustrated. 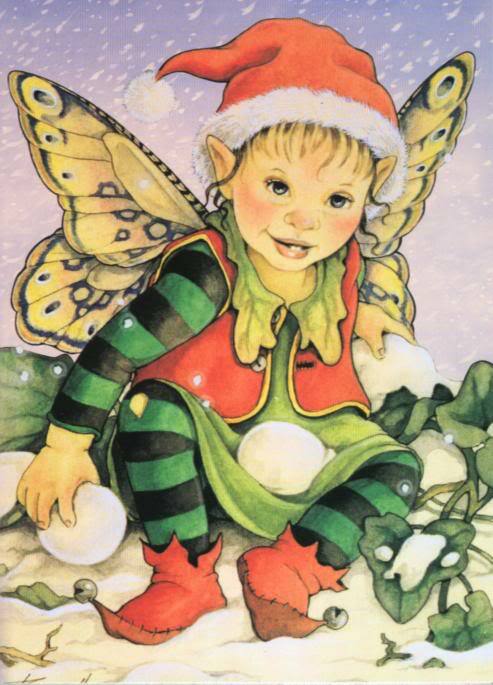 Surely it was elfin magic that kept their limbs moving a’pace their hearts and spirits, for long after Santa returned from delivering his packages that Christmas Eve, the wee elves were still scurrying about the North Pole going about the day’s business. The reindeer demanded feeding by the stablehand elves, as carrots left at various houses throughout their route were barely enough to sustain the reindeers’ flight. The sleigh needed securing and perhaps a good waxing. Bells needed to be polished before the winter’s chill caused them to rust. There was hardly time to celebrate a “mission accomplished,” with little time off before beginning work on next year’s sketching, building and painting of toys. Santa, more content than exhausted and dragging his empty sack behind him, stripped off his heavy woolen jacket to expose his thermal shirt under the straps of his straining suspenders. He had clearly overdosed on warm milk and cookies this evening, though for the last dozen or so houses he collected the cookies instead of eating them, and brought them home as a treat for Mrs. Claus. He fell with a plop into an overstuffed chair by the fireplace, and lifted his heavy feet to the nearby ottoman. Taylor, the trusted gentleman elf, bustled over toward Santa, leaning to unbuckle Santa’s boots. Yanking and tugging with all his might, Taylor’s grip slipped on the snow-crusted boots, and he landed, unnoticed with an “oomphf” on the carpet without either boot. Santa’s twinkle directed at Elf Clara alerted her that this boot removal project was a two-elf job. Arms around Taylor’s waist, Clara joined in the tugging and soon Santa’s tired toes were baking by the fire’s warmth raised by Stoker, the chimney elf. What a delightful smell of cinnamon buns came from the kitchen! Mrs. Claus, along with Tucker the head baker elf and his trio of assistants, had been up much of the night preparing a working man’s feast. The December 26th breakfast had become quite a tradition at the North Pole, one where all of Santa’s elves traveled from throughout the Arctic Circle to celebrate yet another successful season of merriment. So hearty was the breakfast that Santa would later slip into what the elves determined must be at least a month-long bear-like hibernation, for have you ever seen the big, bearded, red-suited man in January? Benson the butler elf rang the breakfast bell. Within the blink of the untrained eye, the dining hall suddenly teemed with elves, giddy in knowing that every child had received prized packages under their trees and had their stockings fully stuffed. If you listened carefully over the dining hall’s din, you’d swear you could hear the world’s children ripping tinseled paper from their gifts, closely followed by their squeals of childhood delight. Santa’s elves by their very nature are sweet and empathetic beings. Each year, they are delighted to play this small (and very small if you measured them in inches!) part in bringing joy to any child. No matter the age, from infant to grandparent, they were all called “children” by the eternal elves, especially at this time of year. Christmas just brought out the child in everybody, Santa said. Christmas spirit made everyone good, kind, generous, warm-hearted and usually contented. That’s what made this time of year even extra special the elves thought -- almost magical as if humans could be so. Back at the dining hall, unending buckets, plates and pots of food were passed to each elf’s table until every belly strained in its sweater. Eggs and biscuits, potatoes and hash, pancakes and waffles and gallons of syrup passed over the smiling, chattering lips. Afterwards, Santa’s elves rose in unison and gave Santa a hearty ovation, which he humbly and gratefully accepted with a belly-wobbling “Ho, ho, ho.” Few speeches were offered. Francois the floral elf was typically bashful in delivering the traditional floral bouquet to Mrs. Claus – a small token of gratitude from the elves for her kindness and support throughout this very busy season. As quickly as Mrs. Claus could say “pixie dust,” the hall was cleared and dishes done. Santa adjourned to his study to finish his report, and his elves scattered about to finish their assignments with cheer. Jimmy the janitor elf found his push broom and set about cleaning what he knew from his hundred-plus years of experience was the busiest and shop-worn of all North Pole rooms: the mailroom. Every year, from October through Christmas Eve and every hour on the hour, satchels brimming with letters to Santa were delivered by the postal elves and sorted by their mailroom friends. There, they piled a stack for doll requests, another for trucks, the largest for video games, and the smallest for clothes. Why, last year the pile for those tickle-me dolls grew larger than the one not too many years ago for dolls from some cabbage patch! Stacks of letters were then dispatched to the proper elfin division. As if by magic, the artisan elves completed the toys to match the lists, and the packages were sent off to the gift-wrapping elves. It always amazed Jimmy, on his daily rounds, that somehow all those letters stayed organized. There was one day, Jimmy heard it told, when all the sorting came undone. It was just after Thanksgiving or so and tumbling toward “D” Day (Delivery Day!) when the cart would fly, that the North Pole’s chill air was exceptionally gusty. Perhaps it was a blast of El Nino, or maybe a practice run of The Sleigh, but whatever the cause, the door to the mailroom blew open with a rush. Letters scattered everywhere, all the way to the top of the high ceilings of the Tudor-style madhouse with its darkened exposed beams. Soon it was raining letters and Santa’s elves followed their tiny upturned noses to the ceiling to look more in amazement than dismay. Watching the letters dance to the floor reminded them of large and playful snowflakes. They took the dilemma in stride, smiling, laughing, running and plopping into each other in a game to see who could retrieve the most letters before they hit the floor. Most everyone was sure that every letter was caught and restacked, and it wasn’t until this day that Jimmy would discover otherwise. The room echoed when Jimmy pushed the door open to start his work in the mailroom. It was empty now that each of the letters had been read, requests filled and catalogued and stored away in the drawer next to the “Naughty” and “Nice” Lists. He polished the tables and swept under each table, whistling a merry tune (a Christmas carol, still, of course). Whew, this room could use a good airing out he thought, as he lifted one of the corner windows with a grunt. A winter’s chill shuddered through the room. As it did, that long-lost letter fell from its rafter perch, floating with a trail of pixie glitter until it landed with the sound of a broken heart at Jimmy’s feet. How the letter tugged at Jimmy’s heart! How could we have missed this one letter, forgotten this one child, he wondered, and one so needy too? Collecting his wits and his dust cloth, he darted from the mailroom. “We just can’t let this letter go unanswered,” Jimmy told a gathering of Santa’s most special elves. They huddled together their long, pointy hats, whispering in secret to make plans to visit this little town of Montgomeryville while Santa snoozed unaware. They thought they might be late, but it is never too late to bring joy to a child. Surely, Santa would forgive them if they made this special trip without him. Somehow, they figured, they could slip into the life and soul of little Clarissa Kindle and the family she loved. with a bit of fine fairie glitter, make a wish..
...and let's see what comes your way. What a wonderful card and story. A great tradition to start for your granddaughter. Fairy dust sprinkled (it actually flies in my craft room) Have a wonderful New Year. Oh Ellen, reading your post just sent all the fairy dust swirling around!! 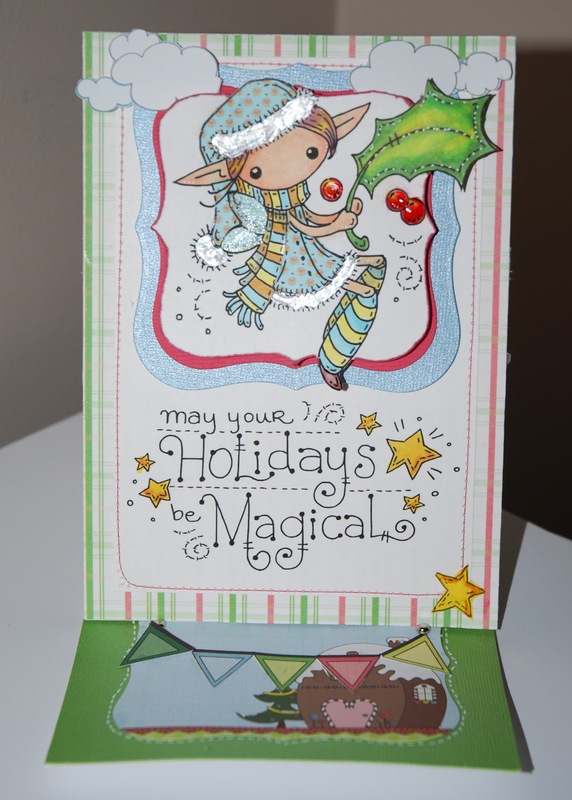 Your card is fabulous and I too love those whimsical little images from Melissa! Love, love your story and reading it I felt the whimsical magic of Christmas!!! You best believe there will be an Elf on the Shelf here in my house next year!! With eight grandkids I am sure he will find lots of things to get into LOL!! Thanks for sharing your wonderful card and story and bringing a bit of magic into my heart today!! A fabulous card. So very cute. It is just so ADORABLE. 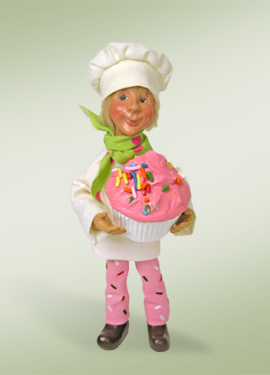 I had never heard of Elf on the Shelf, but you can bet next year there will be one at our house. The story is fabulous! Your granddaughter will love it! What a very special tradition! You are a very talented lady! Love your card and the stitching details. Growing up we had an elf that we put in our tree every year and when my mom passed away 14 years ago I couldn't find it. It broke my heart because it wa the one thing i really wanted. Several years ago I found the same elf at Mervyns and bought one for me and my brother and my elf sits on a branch in front of my tree every year. Saw the elf on the shelf story last year for the first time and thought, I never knew there was a story about my elf. It's so awesome to find out you were the mastermind behind it. Totally awesome. I haven't bought it because I don't need the elf cause i won't replace mine. Tried just finding the book but they dont sell it separately. 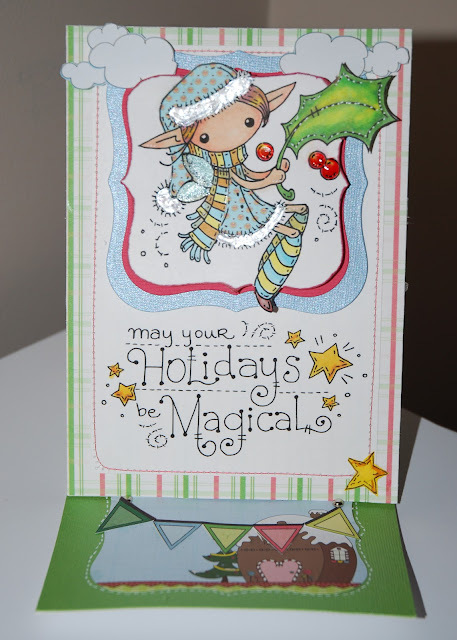 Thank you for sharing your pretty card and your magical story. I was totally drawn in and didn't want it to end; wanted to read more about the elfs and what happens at the Kindles. You should get it published. I would buy it. You are a gifted story teller. Great card! LOVE the image! TFS! Love the card, love the story. I think I will look into adding one of these to my Christmas next year. Such a really sweet idea and I am sure my granddaughter would love it. Ellen very cute card & luv the story, thx. for sharin.. I knew I shouldn't have read this little excerpt, now I want to know the rest of the story! Great card, and great story. Thanks for sharing. Yes, the elf does look like your Charlotte, but she's much cuter. Thank you all for reading my story, and offering such encouragement! Thank you for sharing your beautiful card and your story!! Pixie dust is being dusted all around! !